Cardiologists are humans and they, too, come in all shapes and sizes. They are, however, more aware of what goes into their bodies and how it affects, arguably, the most important organ. This is also why they say that following a proper diet alone won’t reduce your risk of heart disease. You can eat healthy foods only, but if you smoke a lot and are not physically active, you’re not less likely to have congestive heart failure, Dr. Clyde W. Yancy, Chief of Cardiology in the Department of Medicine at Northwestern University, says. Heart disease is the leading cause of death for both men and women in the U.S., according to the CDC, killing about 610,000 people in the U.S. every year–that’s 1 in every 4 deaths. 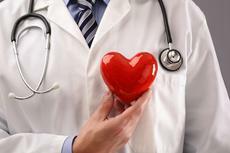 Every year about 735,000 Americans have a heart attack. Nobody can follow a super restrictive diet because then the brain will want to break it. This is just how it’s chemically wired. “There is no absolute list of banned foods,” he adds. Eating red meat is wrong only when you do it every day, and focusing on minimally-processed sugar-free and low in salt foods is always a good idea.